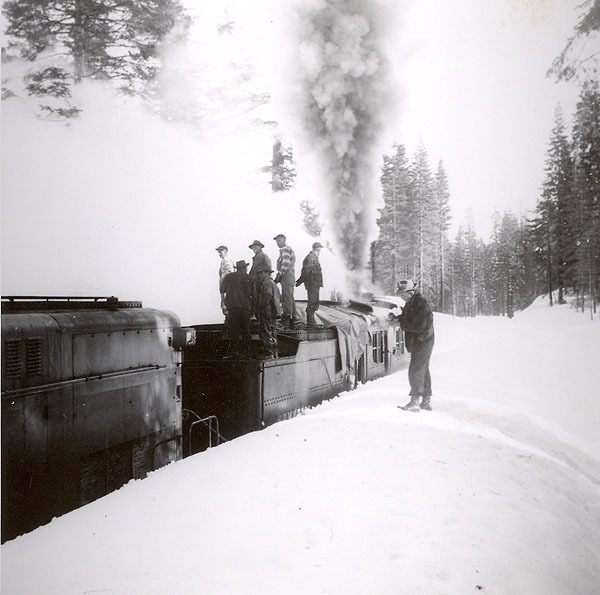 In the first years of operation, the McCloud railroads did not attempt to operate during winter months. When the snows got too deep, the railroad simply closed up shop until the snows melted the following spring. 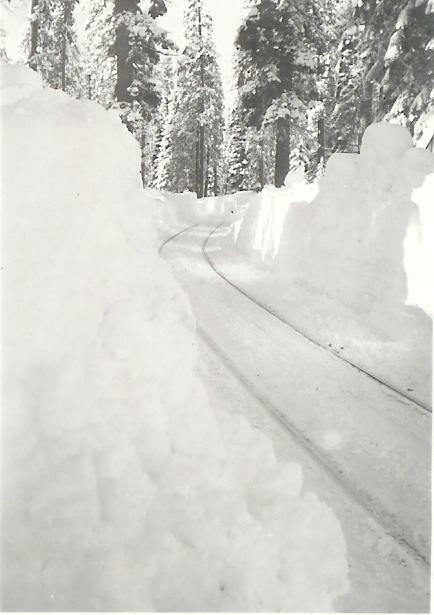 However, by 1905 the road could no longer afford to close down during the winter, and as a result the companies were forced to find ways to cope with the copious amounts of snow that fell on the country during the winter. 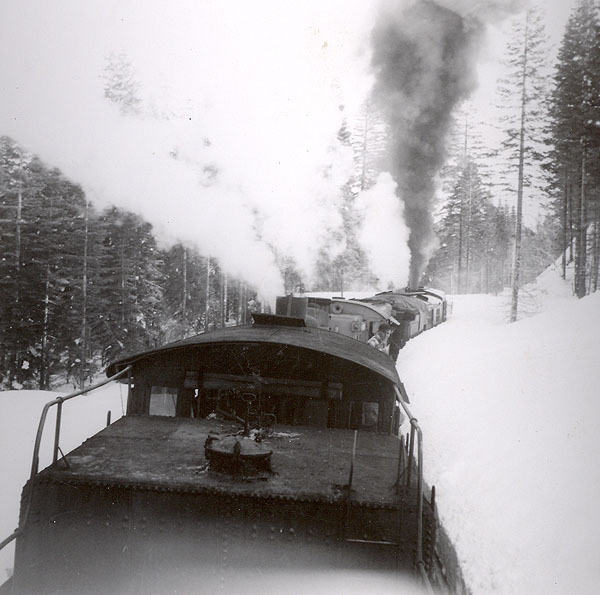 The McCloud River Railroad relied on a number of gigantic wooden bucker plows to clear the road of accumulate snow each winter. These buckers were impressive and, for the most part, were sufficient to keep the railroad operating through most winters. In addition to the bucker plows, the company also owned a number of smaller bucker/flangers, which were small double-ended bucker plows that were equipped with a flanger blade enclosed within the body of the plow to remove snow and ice accumulations from between the rails. Some of these smaller plows were assigned to the lumber company for use on their logging railroads that supported winter logging operations. The bucker plows were supplemented in 1951 with the arrival of a Jordan spreader, which came equipped with wings capable of pushing snow back away from the tracks in addition to a large plow blade on the front. As mighty as these buckers were, there were times when snow fell in enough quantity to overwhelm even them. On those rare occassions the McCloud was forced to turn to the neighboring Southern Pacific to borrow the ultimate tool in the railroad's snow fighting arsenal: the rotary snowplow. 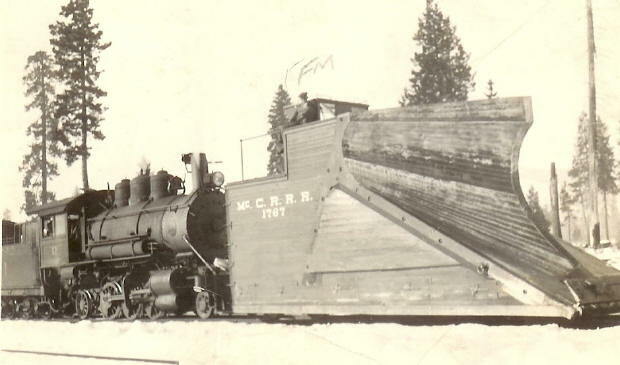 Bucker plow #1767 with locomotive #11, circa 1922. Information written on back of this photo indicates that it is bound for the Pit River Railroad to open it so that the dam construction on the Pit River can continue. The #1767 was destined to stay on the McCloud roster for another 60 years after this picture was taken. It remains on the McCloud today, but has been owned by a private party since 1986. Jeff Moore collection. 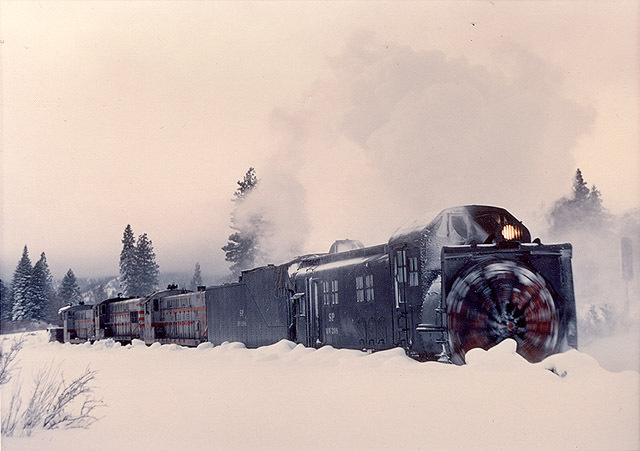 The bucker plows on the McCloud's roster were designed to force their way through the snow, pushing accumulations off to one side of the track or the other. 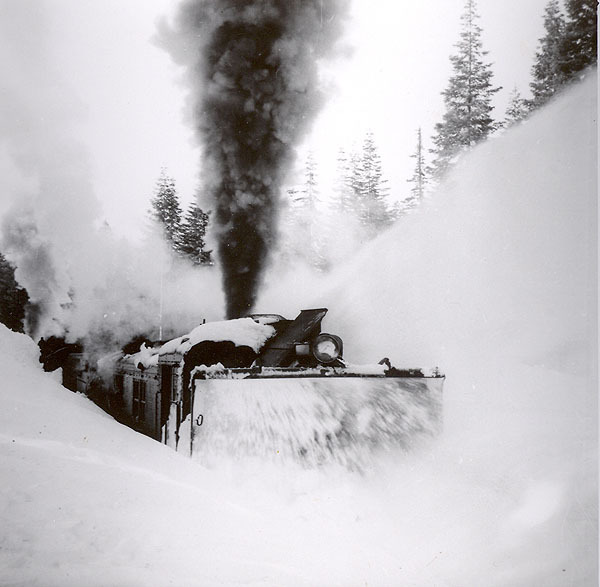 The rotary plow employed a giant rotating plow blade that enabled the machine to literally chew through snow drifts, with the snow thrown up to 200 feet away from the rails. 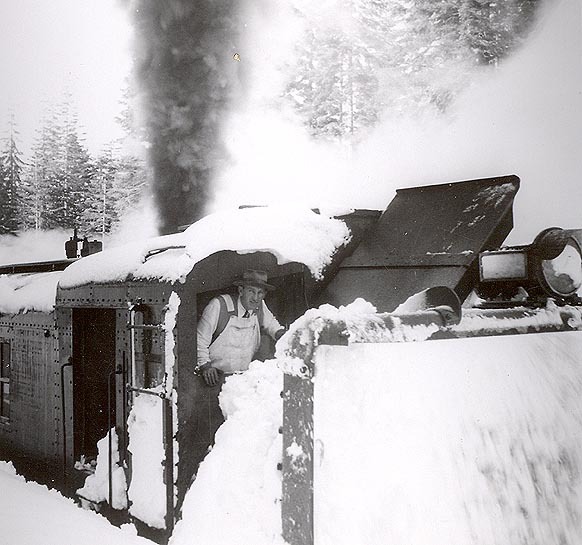 The McCloud River never owned a rotary plow, but did have occassion to borrow one from the Southern Pacific on at least five different winters: 1902, 1912/1913, 1936/1937, 1951/1952, and 1969. 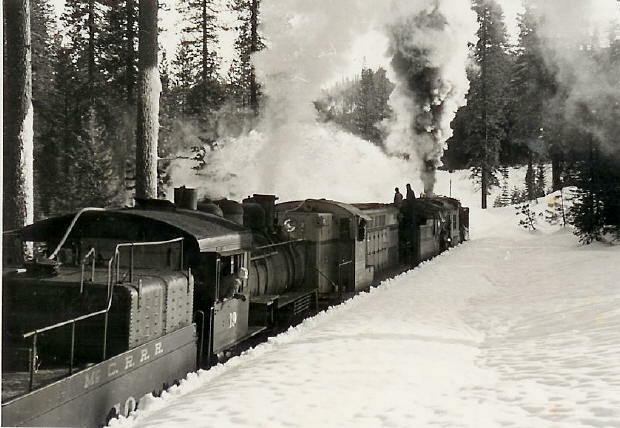 Up until 1952, clearance concerns kept the rotaries from operating east of McCloud. 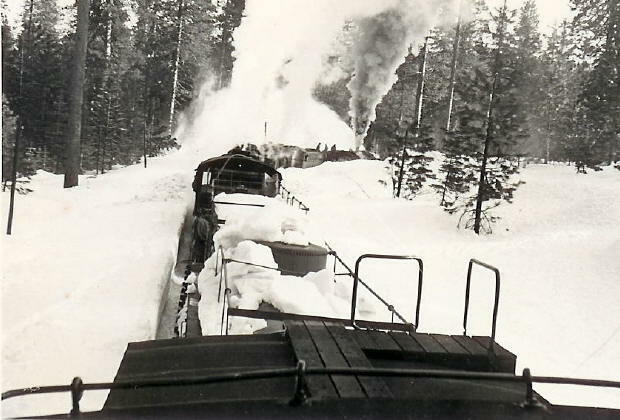 However, a rotary came east at least as far as Bartle, and possibly all the way to Car A, in 1952, and in March 1969 after a series of storms that dumped 20 feet of snow on the railroad a rotary plowed all the way into Pondosa. Management considered running the machine to Burney to widen the cuts through the snow on that line, but the plow weighed more than what the company management felt safe putting on the Lake Britton Bridge. To date, that was the last use of a rotary plow on the McCloud. 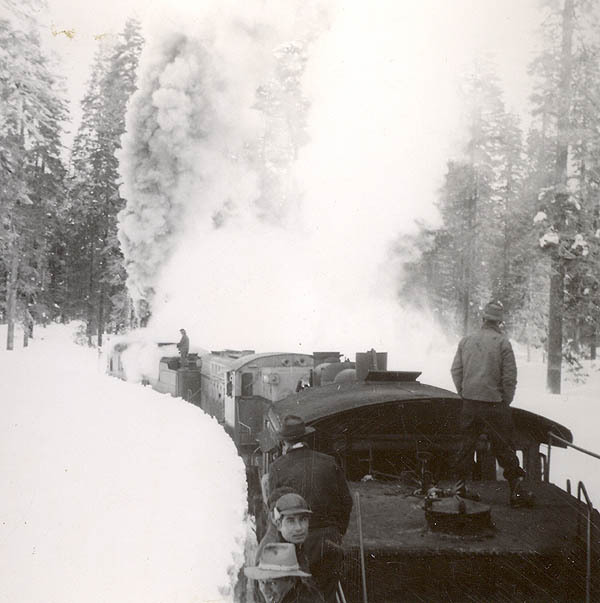 The following photos are of the SP rotary on the line somewhere east of McCloud during the winter of 1951/1952. All photos are from the collection of Dennis Sullivan. The SP rotary with diesel #28 and steamer #19. Another shot of the plow train. The plow train, looking forward from the cupola of a caboose. High banks left on either side of the tracks after the plow has finished it's work. 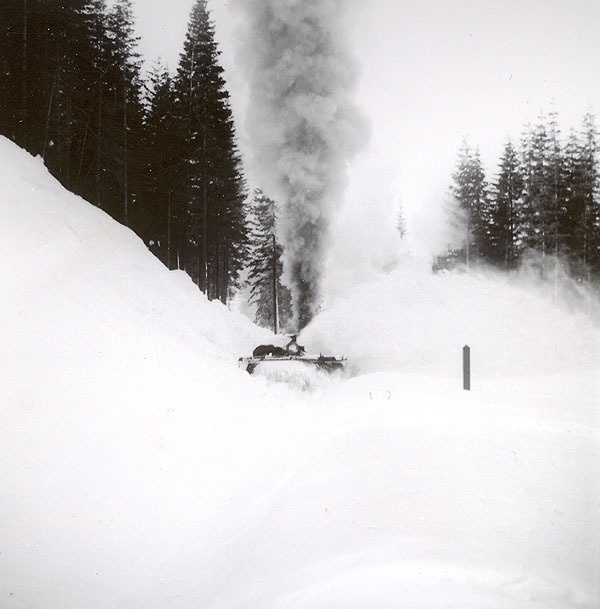 Below are six additional photographs of the plow train east of McCloud in the winter of 1951/1952. All are from the collection of Travis Berryman. 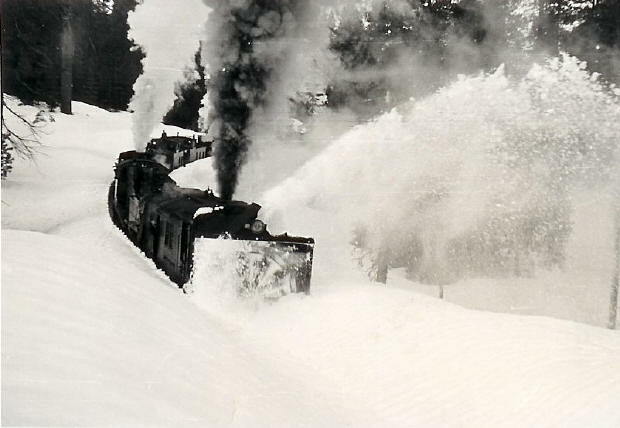 The McCloud borrowed SP Rotary #208 in early 1969 to clear the railroad of 20 feet of snow. The #208, three Baldwin diesels, and a bucker/flanger are clearing the line is this photo from the collection of Travis Berryman.